DME5000 - DVB-S/S2 DVB-DSNG Modulator | AdvancedDigital Inc.
DME5000 is a broadcast digital modulator designed for satellite uplink and terrestrial microwave links. It supports both ASI and IP inputs. 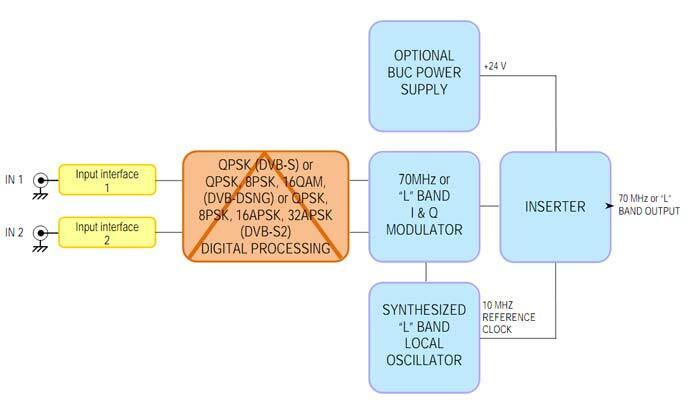 It supports QPSK, 8PSK, 16QAM, 16APSK, 32APSK modulation schemes. Featuring modular construction allowing for easily removable boards and modules, using SMD technology it achieves high reliability and comprehensive system flexibility – all at reduced size. The modulator board, the key component of the DME5000, is based on a single FPGA and is compliant with the ETSI DVB-S standard EN 300 421; DVB-DSNG EN 301 210; DVB-S2 EN 302 307 for Broadcast and DSNG applications. A key function of the modulator is the digital nonlinear pre-correction with the possibility to store and recall set configurations. This function allows to correct the amplitude and phase vs. level distortions introduced by the high power amplifiers (HPAs), therefore increasing output power, MER and shoulders performances. Compliant with: DVB-S standard ETSI EN 300 421; DVB-DSNG standard ETSI EN 301 210; DVB-S2 standard ETSI EN 302 307 for Broadcast and DSNG applications. Supports all modulation schemes (QPSK, 8PSK, 16APSK and 32APSK), all code rates (both mandatory and optional), CCM (Constant Coding and Modulation), normal FEC-frame, Dummy frame Insertion, all roll-off factors and null packet deletion/insertion. RS485; Ethernet 10/100 Base-T (SNMP and web server support) remote control interface option. Event logger (register all alarms, switch-on, faults, etc. with date and time log) with the capacity to store over 5,000 events that can be downloaded through the embedded web server. e-mail client to automatically notify, via e-mail (to pre-registered e-mail addresses) variations in the alarm conditions. Please download the datasheet above to view the latest specifications.